Seagate Technology has launched a network attached storage (NAS) product line for small to midsized businesses. The Seagate Business Storage series has been designed to back up all PCs and Macs in a company from one location, with software that is compatible with Windows and Apple's Time Machine. 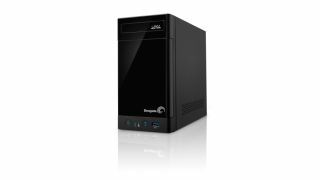 The company says the new NAS series essential provides a private cloud, and can be accessed through Android and iOS applications for mobile devices and a secure networked connection from any notebook. It also provides hardware encryption for selected files. Storage capacities range from 2TB to 16TB. Scott Horn, Vice President of Marketing for Seagate, commented: "Seagate has designed this new networked attached storage to address the changing needs that a growing small business faces." He added that the company has added features to provide additional flexibility in data access and workflow. The two- and four-bay versions of Seagate Business Storage protect data by providing redundant backups of the information stored on the device. Also, a universal storage module slot allows for plug-and-play removable external drives to be inserted and removed from the device to support workflow and offsite backup. Liz Conner, Senior Research Analyst for personal and entry level storage at IDC, said that as demand for storage grows the public cloud will not always be seen as the most cost-effective of securest option for small businesses. "We will continue to see local network attached storage provide one of the best options for these growing business," she said. "Security, data redundancy, and remote access are all features that will play a vital role in the near term as well as the foreseeable future." The new line is due to become available in Europe in March.